The build your own tig thread. Re: The build your own tig thread. Ok so here is what I am working on now. The high frequency high voltage stage of the welder. There are some plans out there that work using car coils and I am doing something similar to that except I am using stuff from the local surplus store and some hardware store ----. This is the set up that I am emulating but I am doing it a little simpler way. Here is the circuit I am using just because its simpler. For the spark gap I think I am going to use a non resister plug from a lawnmower and instead of winding a ferrite core transformer for the last stage I am going to use some rolled up banding material. I have the coil driver working now and should be able to get this all tested and confirmed working before the weekend for you guys. Thats pretty sweet. I thought about doing this. Can't wait to see how it works. If it does, i'm sure alot of people on here would appreciate a proper how to. alot of people on here would appreciate a proper how to. Find More Posts by b18. i physics we used these machines called spark timers, what we did was set it to like 60hz and then made it jump through paper and describe motion. but they would jump over an inch. there has to be someway of using one of those to start the arc and then somehow isolate it from the main welding circuit. I'm pretty sure that's what the High Frequency Start does, essentially. Otherwise you have to get close enough to jump an arc at the current you're working with, scratch start. Here is the basic high voltage generator for the arc start. Its a dimmer switch , a 4uf 660v capacitor and a bosch chinese knockoff coil.I got the coil ($11.79) and the dimmer switch ($2.79) from fleet farm and the cap was had from the local surplus store for $4. If you are having trouble getting the cap there is a few of them here. I would probably go with a little more than 4uf though. The spark will jump 1 inch the way it is but a larger cap should give a little more jump. 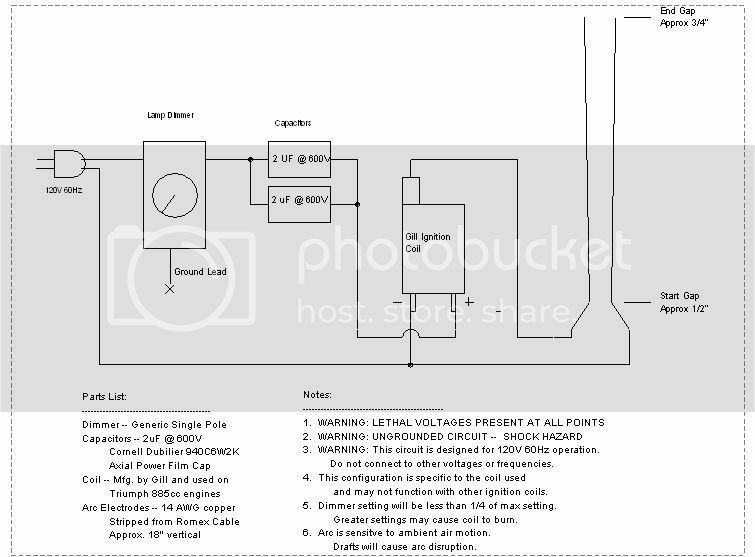 To finish this part we need a sparkplug and need to wind a crude second transformer like in this link.I will be using wound up metal banding material instead of the ferrite core because its cheaper and easier to get. Quick Reply: The build your own tig thread.